On an IBM mainframe running any MVS-related operating system (the current release is z/OS), you use TSO/ISPF to do everyday tasks of program development, like editing source programs, compiling and running them, displaying file contents, and much more. This is our classic book on the subject that was published in 1991. Although this book was written when MVS was the primary operating system on large IBM mainframes, it still works for anyone who's developing programs under any MVS successor (the current one is z/OS). That includes beginning and experienced programmers, application and systems programmers, and computer operators. 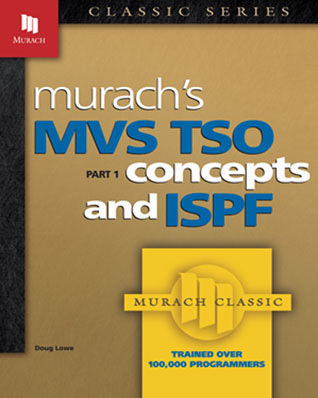 "MVS TSO, Part 1 is a good learning tool. Even though I've been an ISPF user for 10 years, there are many new techniques I will now try." Chapter 1 introduces you to the operating system and shows you how TSO/ISPF ties in so you’ll understand how to use ISPF to control the operating system functions. The remaining 7 chapters teach you how to use ISPF for everyday programming tasks: editing source programs; compiling, link-editing, and executing programs; displaying file contents; creating, copying, and deleting data sets; managing program libraries; and much more. Although these ISPF tasks are tough to figure out on your own, you’ll master them easily with this book. You’ll also find that you can do some tasks in more than one way. So this book does more than teach you how to use the ISPF options—it also tells you what options do similar things, which ones are the most useful, and when and why you would use each one. This is the second book in our classic two-book series on TSO. It teaches ISPF users how to go a level deeper and use TSO commands directly for program-development tasks. Then, it teaches how to combine those commands into time-saving CLIST or REXX procedures. This book shows you how to use Job Control Language (JCL) to compile and execute your programs. Since several ISPF options rely on JCL, you won’t last long in an IBM environment without knowing how to use it.